One of the beers that helped 3 Ravens secure the 2014 Champion Small Australian Brewery title was this Pedro Ximenez barrel-aged Belgian quad that was former head brewer Adrian McNulty's attempt to create a beer as close to the sherry that once inhabited the barrels. It was an honourable venture and one carried off with aplomb. While Adrian has moved on to pastures new, the barrels remained and his replacement Brendan O'Sullivan has kept the Druid alive. 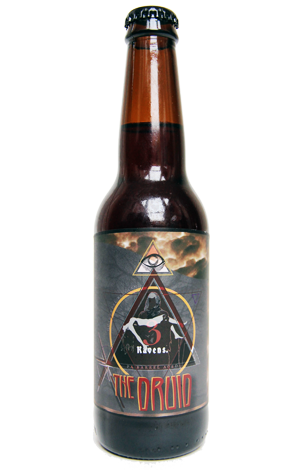 With the oak being less PX-ey second time around, Druid Mk II is a little less juicy but no less enticing for lovers of big, complex Belgian strong dark ales. If memory serves correctly, this time around the beer is a touch leaner but still sticks around for the duration and comes complete with the full roster of dark fruits, cherry cola, dark sugar, berries, treacle and banana plus a gently prickly carbonation to help its 11 percent ABV traverse the palate. Warming and quite delicious.